Sewer Cleanout Locations: Exterior Access to Your Home Sewer Service- Armchair Builder :: Blog :: Build, renovate, & repair your own home. Save money as an owner builder. It’s common for new homes that are located in an area with city utilities to have a sewer cleanout in the yard. This cleanout is a pipe that typically terminates at, or near, the finished grade and is used for access to the home’s sewer service line. Some common questions regarding the placement, use, and protection include, “What are some typical uses of a sewer cleanout?” “How do I find it in my yard?” “Are there any places to avoid when installing one?” “How can I make sure the cleanout isn’t damaged by landscapers and vehicles?” Let’s see if we can answer some of these questions for you. What is a Sewer Cleanout? So before we get started, it’s important to fully understand what a sewer cleanout is and what it does. The cleanout is a pipe that rises up through the ground vertically from the house sewer line that runs underground from the sewer main at the street to the house. The house sewer service is typically pitched to allow gravity to transport sewage from the house out to the larger municipal pipe at the street…also called the main or sewer main. Sometimes problems cause the house sewer service line to backup. This is where a sewer cleanout in the yard comes in handy. So what is the sewer cleanout used for? As the name implies, the cleanout can be used to remove obstructions in the sewer pipe with a plumber’s tool called a snake. The sewer cleanout can also be used to send a camera down the pipe to check for potential problems. A camera can typically tell if a pipe has been crushed or if it has a dip from settlement. If a portion of the pipe settles and causes a low point or dip, solid particles can get stuck there. “But I have a cleanout in the basement, why do I need one in the yard as well?” Opening up the cleanout in the basement to insert cameras, snakes and other tools is possible, but it can get messy. If you have a finished basement you will definitely want to start diagnosis from the cleanout on the exterior of the home. Plot Plan – Your new home’s engineered plot plan will typically show the location of the house sewer service line (also called a lateral). This will give you the exact location for future repairs and to avoid damaging it when digging. 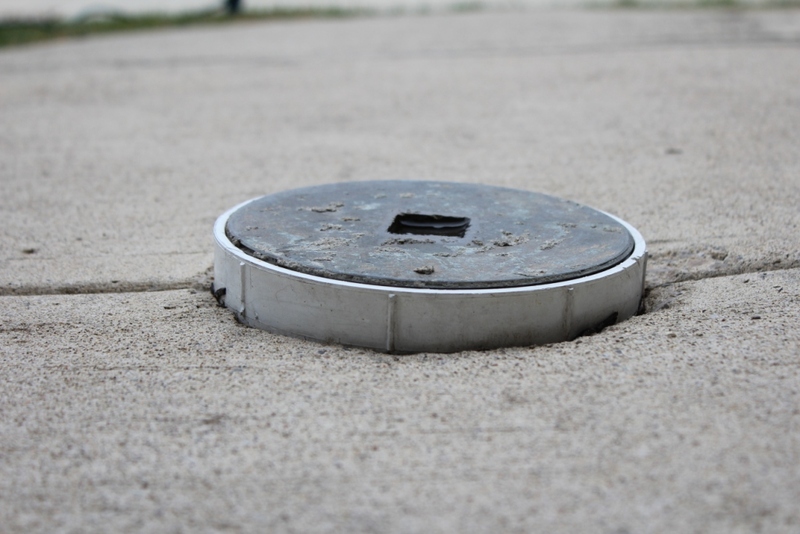 Curb – Sometimes plumbers will mark the location of the sewer cleanout on the street curb for future reference. This location, along with the spot where the sewer enters your home will give you an idea of the location of the underground sewer pipe and cleanout. Connecting these two points with an imaginary line will give you the approximate location to look for the cleanout. Metal Detector – Many builders and plumbers will place a piece of steel rebar next to the cleanout pipe in the ground so it can be located in the future with a metal detector. City – Stop by your local city sewer department. Many of them require the plumber that installs the sewer service to provide them with a drawing showing the location. These locations are kept on file. Subdivision Development Plans – The local building department may have a copy of the overall development plan for your community. If so, you may be able to have them show you the location in your yard where the main sewer tap took place. The tap is just a pipe that is stubbed off the main sewer line at the street into your property to allow the house plumbing contractor to connect to. If you are building a new home, be sure to have your engineer mark the location of the sewer service line and cleanout on your plot plan. You may also want to have the plumber mark the sewer line location on the curb when it is being installed. It’s also a good practice to have a piece of rebar buried next to the pipe so a metal detector can find it. I can tell you from experience from building over a thousand homes that you don’t want to place your sewer cleanout just anywhere in the yard. First, it should be kept well clear of any driveways. If a vehicle runs over the cleanout it can cause major damage to the sewer line resulting in thousands of dollars in repairs. A force pushing down on the top of the cleanout will push the pipe down and crush the sewer line below. Concrete and asphalt surfaces should be avoided as well. The photo above shows a sewer cleanout in a concrete entry walk. You can see the pipe sticks up above the surface creating a trip hazard. As with many concrete surfaces, the walkway has settled. leaving the pipe too high. This will be difficult to repair without cutting and removing the concrete slab around the pipe. It’s also a good idea to make sure the cap on the pipe is flush with the final grade. This will help to protect it from lawn mower blades, lawn tractors, leaf vacuums…etc. Some other recent Armchair Builder articles about sewer systems that you might be interested are listed below…and if you are thinking of building a new home, stop by our eSTORE for some great resources to save you money and hassles. House Sewer Protection – How to protect your sewer cleanout while building your new dream home. Sewage System Grinder Pump – When is a grinder pump necessary for your basement bath and why? Septic System Inspection – Everything a homeowner needs to know about inspecting their septic system. Water and Sewer Service and Underground Plumbing Installation – This is part of the series of articles on How to Build a Home.